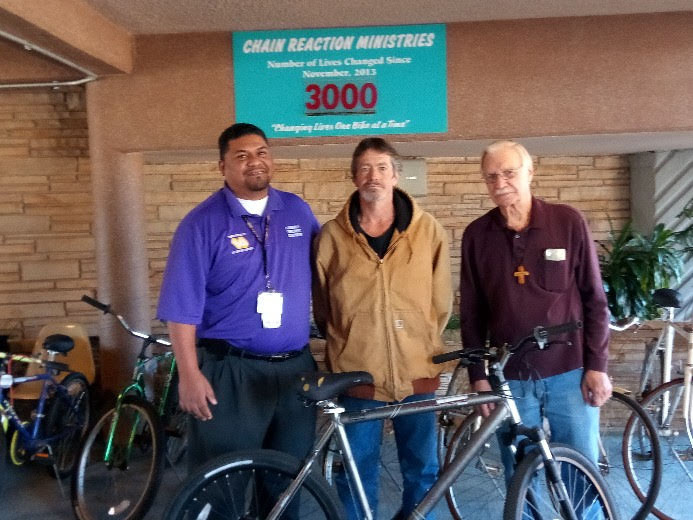 At Chain Reaction Ministries, we take used bicycles, fix them up, and work with partner agencies to get them into the hands of those who need them. Most of our adult bicycles make their way to agencies such as the Veteran’s Administration, HOPE Community Services, etc. so that clients can obtain and keep employment. We have given away over 3,000 bicycles since November 2013. If you would like to give monetarily to support this vital ministry, please go to the GIVE button above. Once there, you will be prompted to give an amount, and then you may select CHAIN REACTION MINISTRIES on the list. If interested, we would also love to have you work as a mechanic in our bike shop each Monday-Thursday from 10 a.m. to 2 p.m. Thank you for supporting us as we strive to change people’s lives, one bike at a time.